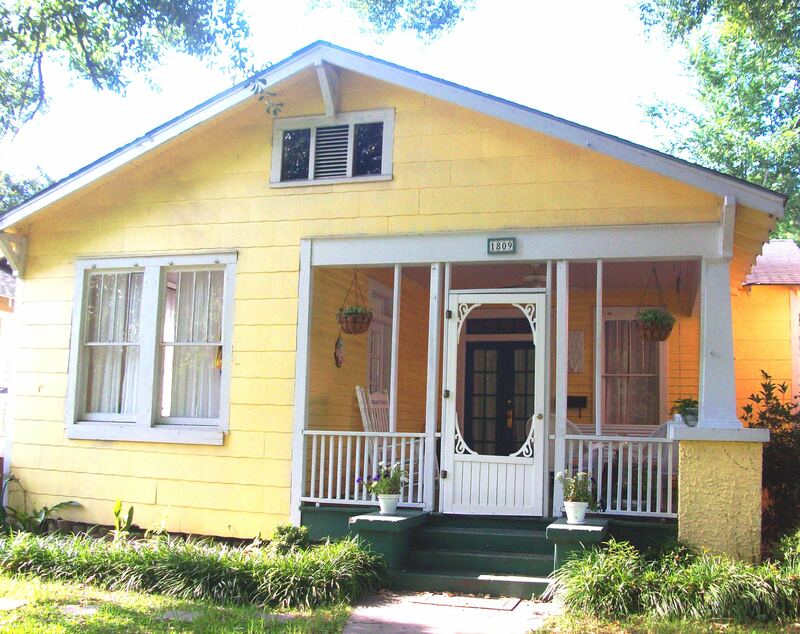 You can see in this old photo from our House Tour page that our front porch has sort of an enclosed look to it. My best guess is that it was screened in at some point, but by the time we bought the place the screens were gone. I didn’t mind it too much, especially since we live on a block with quite a bit of foot traffic. I felt like the door provided a little more privacy. Unfortunately, the door has been slowly falling apart for some time now. And on Sunday it met its final death seemingly out of nowhere. We came home from lunch and it came apart as we were making our way onto the porch. I can live with a lot of things, but that was just way too junky for me to tolerate. I sent Nick out there to demo it while I snapped away with my camera. My neighbors were outside enjoying the weather and I’m pretty sure they think I’m a little nuts with all the picture-taking (I don’t think they get the whole blogging thing). The door was really easy to remove by the hinges, but then we were left with the empty frame. Sort of odd looking, don’t you think? It took a lot of encouragement–I guess it felt counterintuitive to be destroying a part of the house–but Nick was able to get rid of it by tapping at the joints with a hammer. I still need to fill and paint where it damaged the header a little bit. I’m fresh out of wood filler. I also removed any remaining nails or screws except for this one that was too stubborn. I’m not sure what to do about it. Maybe use some kind of tool to cut it off or grind it down? Same with these supports going from the railing to the header. I think that they were put in place solely to support the long gone screening, but we couldn’t get them out without risking the railing as well. This isn’t something I ever would have taken on if the door hadn’t crapped out, but I’m loving how much more open things look. Now I totally want to get rid of those other supports and maybe even replace the columns on either side of the doorway with short posts (as long as they’re not structural, of course, so that probably isn’t something I’ll be tackling ever unless I find out for sure they’re safe to remove). We actually went for a walk around the neighborhood after wrapping up the whole porch situation and I kept my eyes peeled to see how other homeowners dealt with the whole railing/column situation. I was surprised to see that many of them didn’t have any railings at all! I don’t think that’s practical for us, seeing as I’m clumsy and we have a little one, but I loved the open and uncluttered look. I would love love love to have uninterrupted sight lines above the railing, and I feel like that’s much more in touch with the architecture of the house anyway (bungalows have historically been designed to be very connected to the outdoors). I wonder how much it would cost to have a structural engineer come out and take a look? I’d love to open up the kitchen doorway/pass-through as well, so maybe I could knock out two birds with one stone by having a engineer come give his/her two cents on both projects (neither of which I can afford right now anyway so it’s a moot point!). If money grew on trees I’d have taken on so many costly projects in this house already! Good thing I have budget constraints to force me to wait and really think about what I’m doing, haha. I definitely need some time to consider this one. I thought your door seemed a little wobbly the other day…but I like it being so open! Thanks, I’m really liking it too so far! I agree, I would never have told you to take down the door, but it looks good! I bet you could get a hand saw and saw horizontally against the railing and the top and take out whatever screws are holding those two side supports. I doubt they are load bearing! Thanks! I was thinking of getting a jigsaw anyway and I think maybe I could use it like you described. Just gotta talk Nick into it! I really like the way the railing looks, but it does look much better without the door. Thanks! The railing is a pain to keep clean (as in, I don’t keep it clean. It’s really dirty) but I like the look and I think we need it for safety.